Indoor screen for presentations, movies, slideshows, and more! 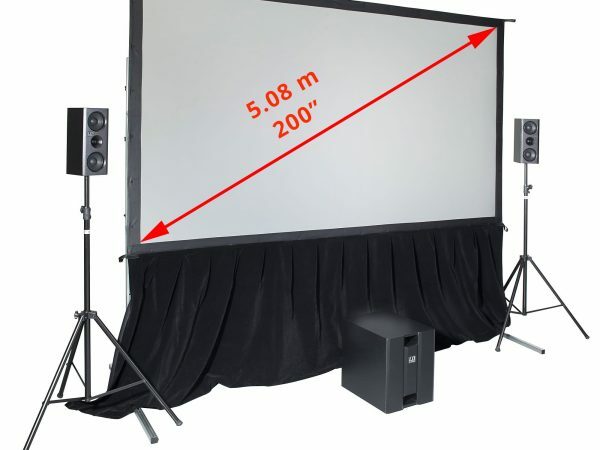 For business and entertainment, use this system with a stretch projection screen, high quality sound system and short throw projector. 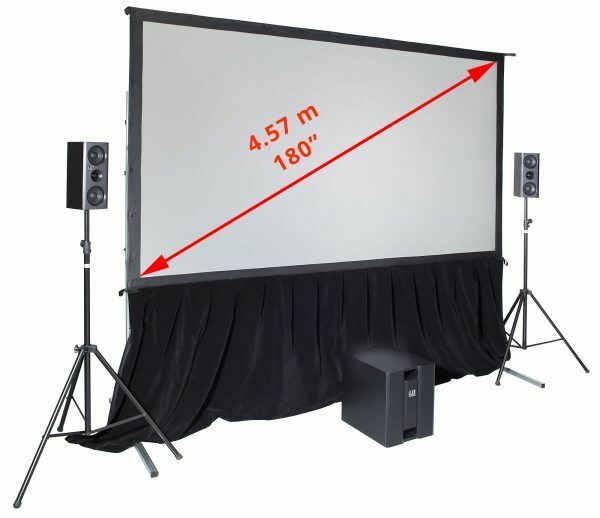 This seriously BIG indoor projector screen comes with a wheeled case for transport, LD speakers, projection and SmartBox® Gold with road case for maximum convenience. Check out the video with instructions. Screen: Includes both front and rear screen surfaces; surface simply attaches to the screen frame with press studs. This ensures a completely flat surface for great picture quality. The screen frame is constructed from 32x32mm square aluminium tubing. Audio: LD Speakers with sub-woofer. SmartBox® Gold is supplied pre-wired for plug and play technology. The unit is capable of being integrated with various audio visual systems including projectors, speakers, MP3 players, computers and video cameras. System includes a Sony or equivalent Blu-Ray/DVD player, HDMI switcher, audio mixer, plugin microphone, HDMI and MP3 auxiliary input connections and stereo XLR to speakers and HDMI out to display device.